Just two years later, during the summer of 1936, Leon’s two sisters were walking out of the Sacandaga Reservoir together during a summer outing, when 25 year old Eugenia Mazanek suddenly went under. New York State Trooper divers found her body hours later. They theorized at the time that she had apparently fallen into some sort of depression and could not make it back to the surface. Leon’s parents were born in Poland and had each settled in Amsterdam during the first decade of the 20th century. After marrying, they moved into their home at 9 Grand Street, where they raised a total of seven children, five boys and two girls. Leon had been named after his Dad, who had a successful career as an agent for Metropolitan Insurance. Young Leon had graduated from Wilbur Lynch High School in 1939 and went to work for GE in the company’s apprentice program. When the US entered WWII, Leon and three of his brothers entered service. Alfred was a private in the Army, John became a Captain in the Air Force and Henry, an Army Lieutenant. Meanwhile, Leon had joined the Navy and completed machinist mates school at the Naval Training Station in Illinois, where one of his classmates was Amsterdam’s Baldy Verderese, After completing all of his training he came home on leave on New Years Day in 1944. Later that month he received his first ship assignment and was sent into action in the Atlantic theater. Leon was a watertender 1st class. A watertender is a crewman aboard a steam-powered ship who is responsible for tending to the fires and the boilers in the ship’s engine room. With the German Navy defeated in the Atlantic, Leon’s ship was diverted to the Pacific to help in the final assault against Japan. On March 20, 1945, they engaged the enemy and Leon was hit by shrapnel from an exploding Japanese shell and died instantly. He was buried at sea. The late Bob Going wrote about Leon in his wonderful book “Where Do They Find Such Men”. Bob was kind enough to add the comment below regarding this post. I miss having Bob Going commenting on my posts. One day I went through a box at the Walter Elwood Museum in Amsterdam and came across a scrapbook kept by a high-schooler named Leon Mazanek. I found it quite fascinating. The young naturalist had journeyed around town collecting plant specimens which he glued in the book with careful notations of where he had collected the item and when, together with identification of the item and its utility for mankind. Some of the plants came from my own neighborhood. Some of the species grow in my own yard. I spent more time going through this seventy year old record than I ordinarily would have because I knew Leon Mazanek. Sort of. I knew him as one of the 180 or so Amsterdamians who didn’t make it home from World War II. Leon W. Mazanek. Born in Amsterdam April 16, 1921. Graduated from the Wilbur H. Lynch Senior High School, Class of 1939. 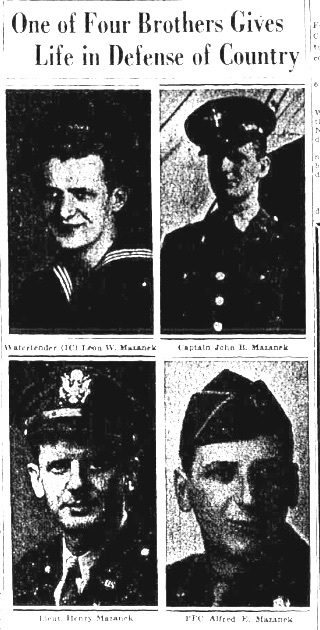 Before entering the Navy he’d been an apprentice at the General Electric Company in Schenectady. Enlisted in the Navy, November, 1941. Sent to the Great Lakes Naval Training Station in Illinois for basic training. Assigned to school there and later at Norfolk, Virginia, finally being sent to the Naval Training School at Philadelphia. He’s aboard the destroyer USS Halsey Powell on March 20, 1945 off the coast of Japan. The ship is refueling, connected to the aircraft carrier USS Hancock, when a kamikaze pilot aims his plane at the carrier, scrapes the flight deck, and then smashes head-long into the Halsey Powell. Mazanek is killed instantly. There I am, flipping through his plant book, with the knowledge that I have in my possession a photograph of the moment Leon Mazanek died. I, my officers and the crew of our ship miss your son very deeply and offer our sincerest sympathy to you, whose loss is so much greater. He was hit and killed instantaneously by shrapnel, in action with the enemy off Japan on March 20. We buried him at sea on March 22 with a Catholic service. We are sending you the flag which we used in the ceremony. If some photographs of the service develop satisfactorily, we will mail them to you later. We will always remember our friend and shipmate, as a fine, upstanding, competent, hard working man. During the last few months, especially, when we were frequently in action with the Japanese, he performed his duties most creditably and so served his country well. You may be very proud of him. He was a brave man. We consider it a pleasure and a privilege to have known him and an honor to have served with him. We miss him very much. He had three brothers still active in the service: Pfc. Alfred E. Mazanek, then in the thick of the fighting in Germany, Capt. John B. Mazanek with the Army Air Forces in England, and Lt. Henry Mazanek, last heard from in Mississippi. A sister, Kathryn Stella Mazanek, of Amsterdam, also survived. In preparing this book, and its companion Honor Roll: The World War II Dead of Amsterdam, NY, I posted some of the raw research, such as the above, on the Internet. Captain Merrill, commander of the Halsey Powell at the time of Leon Mazanek’s death, died January 7th, 2010, in his 96th year in Newport, Rhode Island, the result of a stroke suffered on the 29th of December. I thought you might like to know that the week before the stroke, I found this posting and called to ask him about the letter he had written to the Mazanek family after the death of their son, Leon. If you’re not careful when you do this stuff, sometimes you start linking fancy unto fancy and playing the “what if” game. “What if” that kamikaze bounced a few feet further and landed in the drink. Maybe Leon Mazanek comes home to Amsterdam and stays. Who knows, with the GI Bill and all maybe he becomes a biology teacher. I can see his son joining the gang from the neighborhood in a pick-up baseball game on a Saturday morning at the four diamonds behind the Wilbur H. Lynch High School. Heck, maybe I ask Leon’s daughter to the Junior Prom. But there is no future for Leon Mazanek, of course. Just the end, in 1945. Thank you so much Robert for filling in these details about Leon Mazanek’s life and death. I’ve now referenced your comments in today’s post so that any future readers are pointed to them.